There are so many cookie recipes around but often so little time to bake during the busy holiday season. You can vary this basic dough to make a wide variety of cookie recipes. Add other flavorings like maple, ginger or cinnamon. Add chopped dried fruits like apricots or dates. Or bake them plain in holiday shapes and decorate with colored icing. Karen Ciancio is a cook and lover of all things food and cooking related. 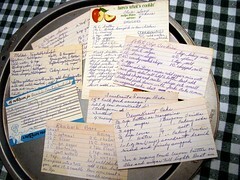 Her website http://www.cookingnook.com contains easy dessert recipes, plus lots of other recipes, cooking tips, measurement conversions and kitchen ideas.